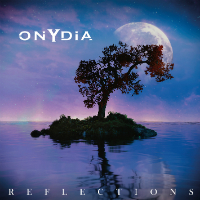 ONYDIA are an Italian Prog Metal band composed of ex ELARMIR members. They play melodic, modern sounding, Prog-infused Metal with a few Gothic influences and a dramatic approach. “Reflections” is their first record, following single “Dyaphany” which was released in 2016. I will admit that this has been a difficult review to write because, in a way, it is as if I am reviewing two different EPs by the same band instead of a full-length. “Reflections”feels like a fractured album with two distinct halves, one heavier and weaker, and one dramatic, more delicate, and stronger overall. Coincidentally, these two halves are literal tracklist halves. The first four tracks on the album are the least memorable songs. Single “The Unknown” is the closest we get to a catchy track, but the reason it feels better than the three tracks that follow seems to bedue to the fact that it comes first. In fact, “The Unknown” manages to establish a formula that ONYDIA repeat over and over again on the sixteen minutes that follows it. Even the piano touches that give “The Unknown” a bit of a dramatic flair get used to the exact same effect on “Breath” and “Silence” up to a point. The musicianship is top-notch for sure, as is the singing by Eleonora Buono, but the songwriting suffers, with songs feeling a tad overlong, especially when reaching the six-minute mark. There’s a bit of a derivative alternative sound to the tracks, while the Metalcore-ish breakdowns sound great but don’t add much to make things shine. Some of the instrumentals seem to occupy a common ground between EVANESCENCE and late-era WITHIN TEMPTATION, which is not a good or a bad thing in itself, but it can get too similar at points. Some Tori Amos vibes on the piano-led verses of “The Memory of my Time” as well as the textured work of the guitar on the song seems to be the most interesting part of this first half of the record. When “My Paradise” arrives the change of pace is more than welcomed. “My Paradise” is a beautiful piano ballad that plays around a bit with time signatures to add some needed variation. The drumming gets a little jazzy and the rest of the band add some PINK FLOYD-like atmosphere. Buono shines in this song, finally getting into the spotlight and managing to explore more of her clear potential without getting lost in the mix. “The Colour of Nothingness” has a truly awesome name and manages to feel epic in scope when compared to any of the longer songs on the first half of the record; despite having some similarities in sound and feel. The songwriting is just more focused; its intro builds instead of erupting abruptly, and the chorus is truly catchy. A catchy riff gets “A New Safe Place” going. This is another example of a less than 5-minutes long song that still manages to have a few changing sections and a strong Prog sensibility. Some almost offbeat synth sounds in the background provide a confusing yet alluring atmosphere. A dub-like bassline and a weird synth sound give the song an interesting shift in sound, at least for a few sections. There is a good balance between heavy and soft sections too. “Reflections” ends with “Diafana”, a lengthy yet diverse song with an 80’s Prog-inspired intro that throws in everything from funky basslines to atmospheric vocal passages. It is a good enough closer to bring the second half of the record to an end. I can’t help but feel this would have been a much better release should it had been a four-track EP; or maybe having another tracklist order to avoid the repetitive nature of the first half. Production aside (coming back to that soon), the songwriting is so much stronger on the last four tracks, and they have truly memorable sections. “My Paradise” shines through and through, being my favorite track overall. The production does hurt the record a bit too. “Reflections” has little dynamic range and some of the songs are so compressed that the heavier sections have a noisy quality to it that can be distracting. The mixing is good in general, but the instrumental work occasionally buries the beautiful vocals, especially on the louder sections. I’ll keep an eye on this band because the stronger work here sounds very promising.